One of the great challenges to achieve long term sustainability consists of converting our existing building stock to a sustainable state. This is often complicated by existing managerial, economic and physical structures that do not let themselves be converted easily. 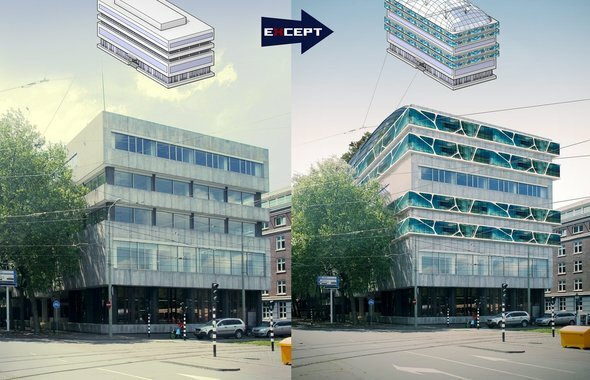 The Government Building Agency (Rijksgebouwendienst) of the Netherlands commissioned Oneplanetarchitecture institute (OPAi) in cooperation with Except to perform a study about this issue. 30 buildings were investigated for the first part of the study. The result was a functional tool for effective, communication and management of conversion projects. The study was subsequently trialed on five example buildings. The communication tool developed allowed clear communication about various stages and approaches of intervention. Some buildings were only energetically optimized, while others had complete restructuring and reprogramming concepts applied, including partial privatization, urban integration, reconfiguration, zero carbon and autarktic conversion options. We continue to refine the methdology developed, study and design various approaches to converting our existing building stock.